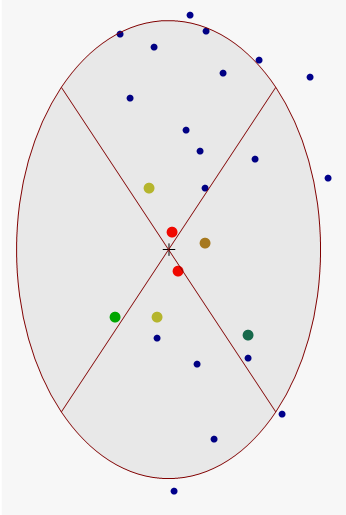 The Weights window contains the list of weights assigned to each data point that is used to generate a predicted value at the location marked by the crosshair. As mentioned above, weights are proportional to the inverse of the distance (between the data point and the prediction location) raised to the power value p. As a result, as the distance increases, the weights decrease rapidly. The rate at which the weights decrease is dependent on the value of p. If p = 0, there is no decrease with distance, and because each weight λi is the same, the prediction will be the mean of all the data values in the search neighborhood. 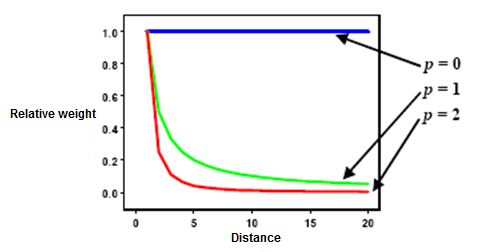 As p increases, the weights for distant points decrease rapidly. If the p value is very high, only the immediate surrounding points will influence the prediction. Geostatistical Analyst uses power values greater or equal to 1. When p = 2, the method is known as the inverse distance squared weighted interpolation. The default value is p = 2, although there is no theoretical justification to prefer this value over others, and the effect of changing p should be investigated by previewing the output and examining the cross-validation statistics. Because things that are close to one another are more alike than those that are farther away, as the locations get farther away, the measured values will have little relationship to the value of the prediction location. To speed calculations, you can exclude the more distant points that will have little influence on the prediction. As a result, it is common practice to limit the number of measured values by specifying a search neighborhood. The shape of the neighborhood restricts how far and where to look for the measured values to be used in the prediction. Other neighborhood parameters restrict the locations that will be used within that shape. In the following image, five measured points (neighbors) will be used when predicting a value for the location without a measurement, the yellow point. The shape of the neighborhood is influenced by the input data and the surface you are trying to create. If there are no directional influences in your data, you'll want to consider points equally in all directions. To do so, you will define the search neighborhood as a circle. However, if there is a directional influence in your data, such as a prevailing wind, you may want to adjust for it by changing the shape of the search neighborhood to an ellipse with the major axis parallel with the wind. The adjustment for this directional influence is justified because you know that locations upwind from a prediction location are going to be more similar at remote distances than locations that are perpendicular to the wind but located closer to the prediction location. Once a neighborhood shape has been specified, you can restrict which data locations within the shape should be used. You can define the maximum and minimum number of locations to use, and you can divide the neighborhood into sectors. If you divide the neighborhood into sectors, the maximum and minimum constraints will be applied to each sector. 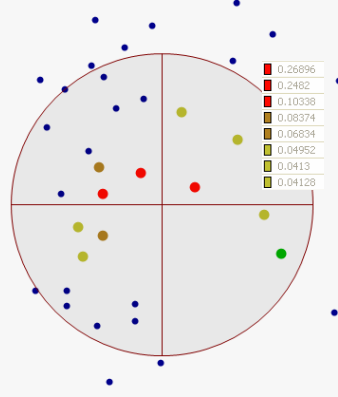 The points highlighted in the data view show the locations and the weights that will be used for predicting a location at the center of the ellipse (the location of the crosshair). The search neighborhood is limited to the interior of the ellipse. In the example shown below, the two red points will be given weights of more than 10 percent. In the eastern sector, one point (brown) will be given a weight between 5 percent and 10 percent. The rest of the points in the search neighborhood will receive lower weights. A surface calculated using IDW depends on the selection of the power value (p) and the search neighborhood strategy. IDW is an exact interpolator, where the maximum and minimum values (see diagram below) in the interpolated surface can only occur at sample points. The output surface is sensitive to clustering and the presence of outliers. IDW assumes that the phenomenon being modeled is driven by local variation, which can be captured (modeled) by defining an adequate search neighborhood. Since IDW does not provide prediction standard errors, justifying the use of this model may be problematic.